Between blizzards and Mount Redoubt volcano, mail service to and from Nome is frequently disrupted right now, and because of the volcano, that may continue for a few months. As you’ll read on page 2, if it takes us a little longer than usual to respond to you, please know that we’re sure trying! We pray for you and your intentions at every staff meeting, and daily, in our own individual prayers, too. Thank you so very much for your kindness toward the isolated people whom we serve and for your prayers. We pray that Our Almighty Father blesses you a thousand fold. OUT OF THIS WORLD: (left) From left, Laureli Kinneen and Danielle Sylvester chat with NASA astronaut Bill Readdy in Studio C. A former U.S. Navy test pilot, Readdy flew on three Space Shuttle missions between 1992 and 1996. Several years ago, he visited Alaska to speak to students of village schools, and it happened that the bush pilot who ferried him around was Laureli’s husband Fen. As you can imagine, Readdy is an expert on what’s happening in space exploration, and in lay people’s terms, spoke enthusiastically about its history, as well as current events, such as experiments aboard the International Space Station. LIGHT MATTER: The days are growing longer. Nome last saw true darkness April 8th, and will next see darkness September 4th. The sun does go down every day of the year, but in summer, it only drops a few degrees below the horizon each night, setting in the northwest and rising a few hours later from the northeast. SPOTTY RECORD: So far this year, KNOM has broadcast about 14,100 inspirational spots, and an equal number of educational ones. We are grateful for your helping hand in making this possible. KNOM is the oldest Catholic radio station in the United States, a powerful beacon of inspiration, education, information, hope and positive companionship since 1971, thanks to you. INSPIRATIONAL SPOT: I cannot escape Your goodness, O God. You surround me like a gentle breeze. My inconsistent values remain, my sin ever before me, but Your love remains the same. I tremble in the face of such love. INSPIRATIONAL SPOT: When you reach the place where shadows are and light ahead is withdrawn, put your hand in God’s and keep it there. You may have to wait a while in the dark until God is ready to lead. But while you are waiting, just pray and pray. Hold onto God’s hand with a solid grip. Do not let go. Keep waiting and holding on, until the shadows pass and He leads you to peace again. 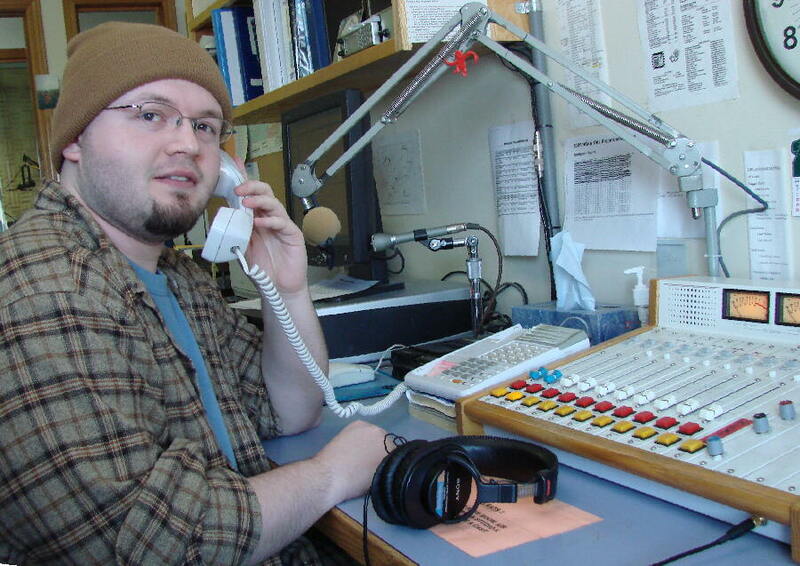 NEWS TO US: (left) KNOM volunteer news reporter John Francis takes a call in the station’s newsroom, from which most news broadcasts originate. 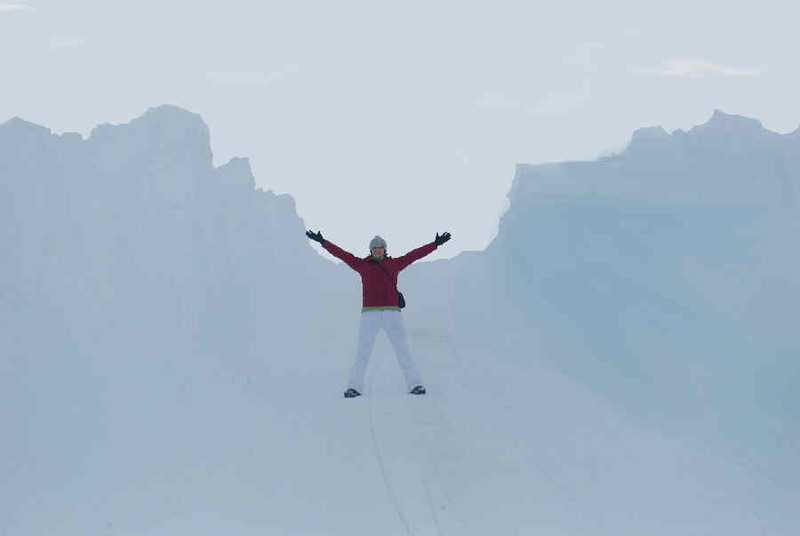 John arrived in Nome just after Thanksgiving, when plenty of snow already covered the ground. He says he can’t imagine what Nome will be like without it! (Left) It's not all office work. 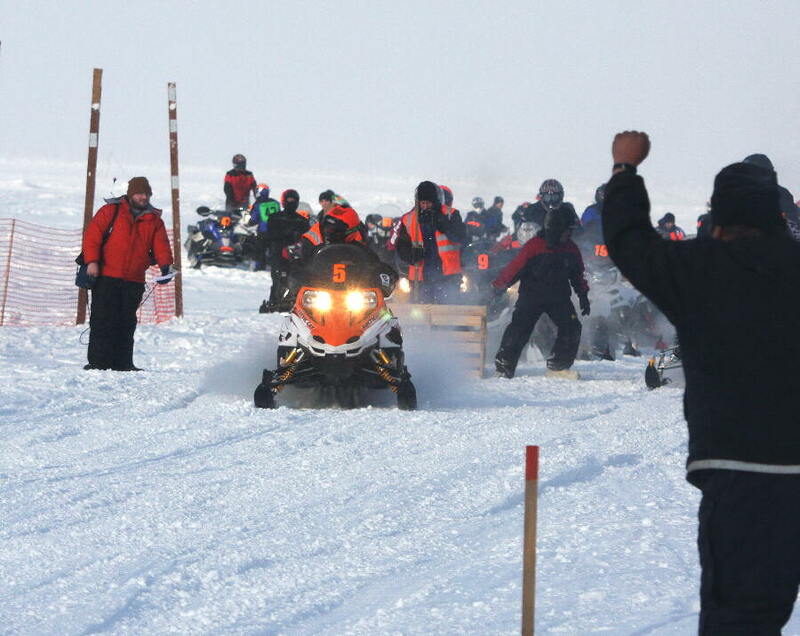 John, in red parka, covers the start of a local snowmobile race, live on the Bering Sea ice. KA-BOOM! It had been brewing since January, and in the final days of March, Alaska volcano Mount Redoubt blew its top, spewing caustic and abrasive ash throughout a large area of southcentral Alaska during repeated eruptions. One event shot ash vertically to an altitude of more than 12 miles! 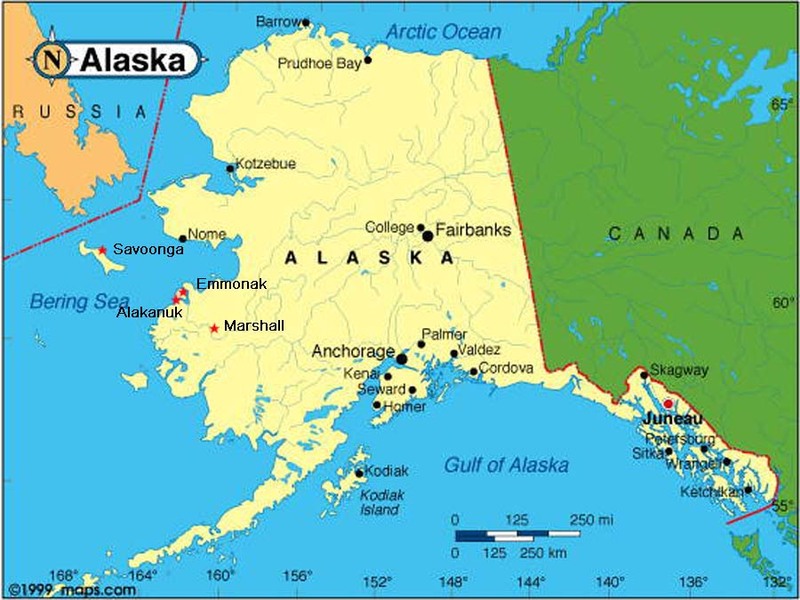 The mountain is 489 miles southeast of Nome, which is in no danger of ash fall, but because the volcanic debris is harmful to both internal combustion and jet engines, the eruptions have frequently disrupted air travel, mail and freight to Nome and other bush points, and have occasionally shut down travel between Alaska and the Lower 48. If the pattern of Redoubt’s last rumblings in 1989-1990 holds true, we can expect repeated, unpredictable eruptions over the next several months. So if it takes a bit longer for you to hear from us, we know the volcano will not apologize, but we ask you to understand that we’re doing our best. MR. SCHMIDT GOES TO WASHINGTON: For KNOM general manager Ric Schmidt, it was a trip to the District of Columbia to confer with fellow broadcasters and chat with the Alaska congressional delegation about issues important to radio and television. His expenses were paid by the Alaska Broadcasters Association, of which he is a two time past president. Please consider adding the KNOM mission to your will. We prayerfully place all bequests into funds that provide for major improvements and future emergencies. Thank you! INSPIRATIONAL SPOT: Lord, make me Your messenger, for the Holy Spirit to touch everyone I touch, whether by the word I say, the prayer I pray or the life I live. 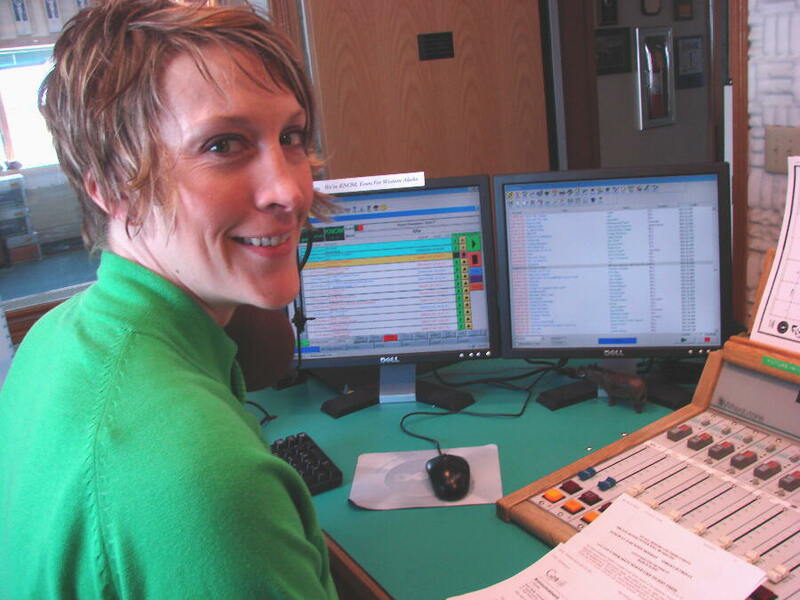 IT COMPUTES: (left) KNOM program director Kelly Brabec is at the controls in Studio A, from which the station broadcasts 98% of the time. The computer screen at left lists scheduled events, such as network newscasts, music and educational and inspirational spots. For the screen at the right, Kelly has selected a list of the 8,600 songs recorded into the computer. This allows her to add or delete songs of various lengths, in order to make each hour’s programming end at the correct time. From Fremont, Nebraska, Kelly was a KNOM volunteer from 1998 to 2000. Like most of today’s KNOM permanent staff, she left Nome with no intention of returning. But return she did in 2002, to work at the region’s youth correctional facility and part-time at KNOM. You can imagine how grateful we are that she decided to return to KNOM full time in 2005. BREAKING UP IS HARD TO DO: The Alaskan term “breakup” describes the period when snow melts and river ice literally breaks up and floats downstream. Often, massive ice chunks will block the flow of a river and form dams, which are known as “ice jams” in Alaska jargon. With a jam in the way, water levels rise quickly. Many of the villages which KNOM serves are low-lying along bodies of water. There is so much snow this year throughout interior and western Alaska that old timers fear that ice jams will be far worse than normal, causing frequent and deep flooding in many areas. You can bet that as the thaw begins, probably late this month or early next, thousands of ears will be especially glued to KNOM for “Ice Jam Flood Warnings,” as the KNOM news department keeps careful eyes on potential flooding throughout its vast coverage area. Thank you for helping to make this life-saving service possible! Thank you for helping keep our mission’s voice strong and effective. INSPIRATIONAL SPOT: No one in the world can change the truth. All we can do is seek it and live it. INSPIRATIONAL SPOT: How often do we consider that in remembering us, loving us, speaking to us in our hearts, God always uses our first names? SNOW BUSINESS: (left) As volunteer Danielle Sylvester demonstrates on this plowed Nome street, there is no lack of the white stuff in the Gold Rush City. Congratulations to Danielle, who passed the tests and is now a volunteer Emergency Medical Technician. (Left) Click to locate villages in the following three paragraphs. THIRTY-FIVE YEARS AGO: In May 1974, volunteer news director Steve Havilland flies 164 miles west to Savoonga on St. Lawrence Island to cover Siberian Yupik Eskimo games. It is the first trip by a KNOMer to report on a village event. Five years later, thanks to seats donated by local bush airlines, village travel becomes commonplace. TWENTY YEARS AGO: In May 1989, the Yukon Delta village of Alakanuk (ah-LUK-ah-nuk) has paid the air fare for volunteer Larry “Spike” Anderson to deejay their high school prom. After that, fog closes the town airport. The weather’s clear in Emmonak (ee-MAHNG-ek), 20 miles away, so villagers snowmobile Spike there so he can catch a plane to a third village, Marshall, upriver on the Yukon, where Russian-style fiddling alternates with Spike’s deejaying in a village-wide celebration. TEN YEARS AGO: KNOM distributes 798 high quality antenna boosters to families in 43 villages starting in May 1999. The $35,000 project is funded by a single contributor who lives in New Jersey. PASSIONATE FOR THE PASSIONISTS: It’s no secret that priests are growing increasingly scarce. 9 of the villages which KNOM serves never see a priest. A handful are lucky to see a priest once or twice a year. The remaining villages typically see a priest only once every one or two months. 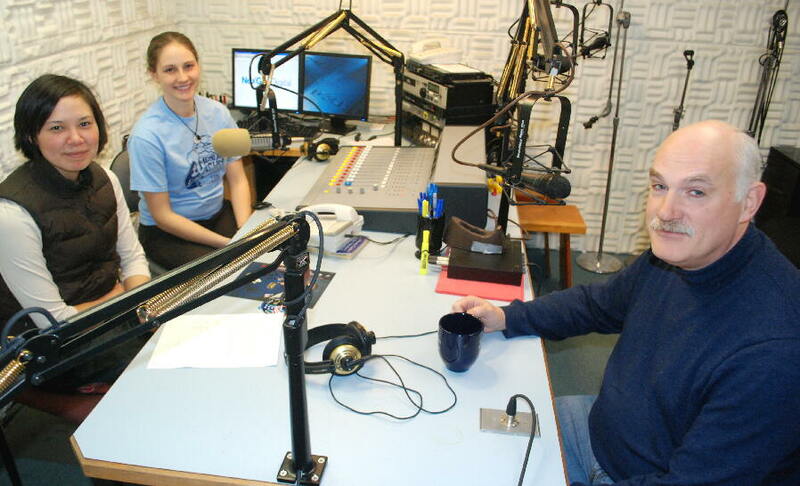 In the mid-1990’s, Nome began losing its pastor many weeks, and we tried various ways to obtain Sunday Mass broadcasts. None worked. The solution came in December 1997, when the Passionist Fathers in Pelham, New York, began sending us audio recordings of their television Masses. Today, Nome is without a priest. That’s why we’re passionate for the Passionists! As ever, we’re out of space, but we are never out of gratitude for your prayers and your financial helping hand. May God richly bless you and those you love.